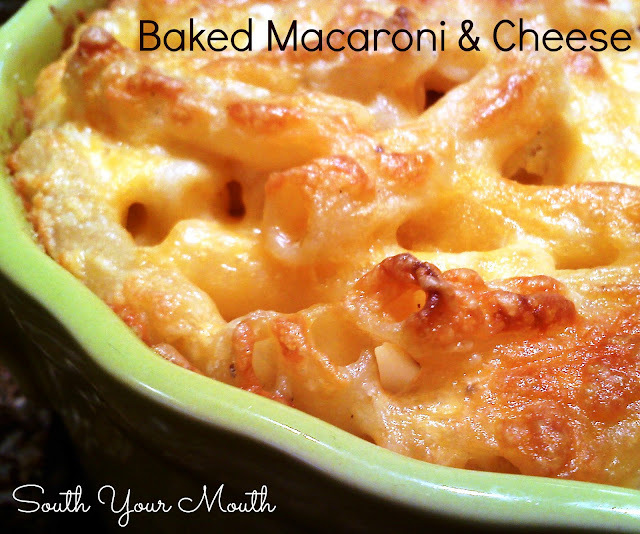 Baked Macaroni & Cheese made with sour cream. I've been wanting to post my Southern Style Baked Macaroni & Cheese forever but it's one of those recipes you don't actually have a recipe for. You just kind of eyeball everything and use what you have. This, however, is not my usual Southern Style Baked Macaroni & Cheese. This is a hybrid of mine and one I've made before with sour cream. The way my family has always made it is to make a custard mixture of eggs and milk and pour it over layers of pasta and cheese (as opposed to the bechamel variety which is also popular). I decided to make my macaroni & cheese yesterday and document the recipe. When I was grabbing what I needed from the fridge, I spotted a carton of sour cream and thought... meh, why not? Combining the two recipes was a reallyreallyreallyreallyreally great idea! It still has everything I love about the custard preparation with a little added creaminess. Score! Meanwhile whisk egg, sour cream, milk, butter, salt, pepper and cayenne in a large bowl until well combined and smooth. Add pasta and 2 cups cheese then toss to coat. Add mixture to a small baking dish (about 1.5 quart). Top mixture with remaining one cup of cheese. Sprinkle with garlic salt. Bake uncovered at 350 degrees until browned and bubbly (about 35-40 minutes). Serve as a side dish for 8 polite or 4 hungry people. Double this recipe if company's coming. Down here we don't serve this as a main course - only as a side dish. Along with six other sides if it's Sunday. We're pretty serious about side dishes, y'all. For reals. My son, now 21 years old, will only eat Kraft original mac-n-cheese, and he likes it slightly undercooked. From the time he was 12, if I wanted some too, I had to make 2 boxes. An entire box is his "snack". And the bugger is NOT fat. There's nothing like a homemade mac and cheese! I've been thinking about this macaroni and cheese since Monday night. Oh yes, it's happening today. The picture looked so amazing that I woke my half-asleep husband and made him look at it. He was as excited as I was, obviously. Good thing he loves me. Thanks, Amanda! I hope you liked it! my oldest loves the box stuff...yuck. lol....I make it from scratch, though...and I'm going to try your sour cream addition...yum! Damn! Kraft Dinner? They would so not know what to do in my house. That's barely an appetizer here. I only feed it to toddlers. Homemade is the way to go, and yours looks delish! I made this mac and cheese for Thanksgiving on Thursday. It is the BEST I've ever had! My cousin asked me for the recipe because her boyfriend loved it so much. I will definitely add this to my list of favorites! Glad y'all liked it! Those pesky internet bugs throw the "amps" in there when you use the "and" symbol sometimes. Thanks for your comment - you made my day! heard this on my radio station last week...SO glad I only make the homemade kind -- and can't WAIT to try this one! No wonder my daughter likes box mac and cheese, shes not supposed to have food with those dye's. My kids love the box stuff as well. However, I now 'cream' the noodles by slightly overmilking it and letting the milk slowly simmer longer to 'thicken' a bit and they seem to like it even more. At least I do. But I've noticed now that my daughter has kids of her own she loves it when I make the homemade stuff once in awhile. But she says to her it's like two completely different sides. Hi, I made this mac and cheese today and it was delicious but I have a question. Do you measure your cheese by the actual cup or do you go by ounces. I've seen before that 4 oz. will yield 1 cup but my 8 oz. block of cheese yielded a loose 3 cups. I doubled the recipe so I ended up using 3 8oz blocks in the casserole and another 8oz on top. Like I said, it was delicious but didn't know how creamy it was supposed to be. Am I using too much cheese? Thank you so much. I'm about to make this for Easter dinner, I know my family will love it. Happy Easter! I always use Velveeta but will try this. We put hamburger and sometimes pepperoni in ours and sometimes biscuits on top like a casserole. It is like left over night and I put everything in. I never made it plain for myself. Will have to try it. I always add a topping to mine that I find is a nice touch….four slices of bacon, chopped, then cooked crispy…drain off most of the bacon grease...add a finely chopped onion to pan...and a few minced garlic cloves…a couple of tablespoons of fresh thyme….let the flavours blend a bit…sprinkle onto bubbling mac and cheese when it is fresh out of the oven. Thank you for a great recipe!!!! Oh my! So Good. My search is over!! I took some Panko bread crumbs and some melted butter and tossed it with the cheese for the top......Crispy/Cheesy YUMMMM! Love the sound of this and will definitely be trying it. Always make mine with a cheese béchamel and had no idea you could make it like you do. I often put layers of shredded ham in it and serve it as an easy lunch or with a salad for a bit more of a meal. Can't wait to try this. Been looking for a good mac n cheese recipe that does not use dry mustard powder. I absolutely hate the taste of that stuff. The intro to this recipe said it had Cottage Cheese in it.. but the recipe doesn't say anything about cottage cheese. Whats up with that.. is there or isn't there any in the recipe. I can't wait to try this so hope someone gets back to me soon. Nope, it doesn't say that. So I haven't tried making homemade Mac N Cheese in 11 years. After my first try ( living on my own for the first time about to be married) Failed. 11 years later and my poor family as only ever got the box. Well I came across your site today, and I just popped the Mac N Cheese into the oven to go with the country fried steak my son has been begging me for since I had my baby. Wish me luck!!!! Happy that so many liked it, but it wasn't for me. While I frequently use sour cream in casseroles, it seemed to overwhelm the m&c, rather than complement it. Sorry! Hmmm, looks like my first comment disappeared...I've been trying to find the giant elbow macaroni that your referred to, like they have on the whole foods hot bar. Have you been able to find the product anywhere? Like what brand? I don't have a favorite. I just ALWAYS buy a whole block and shred it myself. Oh no, I meant like sharp cheddar or mild cheddar or a blend of different cheeses? Also, if I half the recipe would that change the cooking time? Also, should the butter be salted or unsalted? Oh! I use mild cheddar usually. I'd bake about 10 minutes less... You just want to cook until bubbly and slightly browned.